Life has been extra crazy lately (our own doing) and daycare has been no exception! 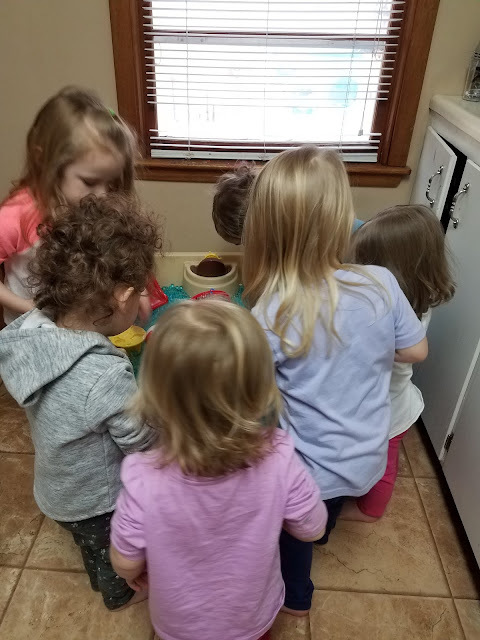 We've been working a lot on sharing, table manners (also quite crazy with one and two year olds at the tables), and reminding kids that we "don't spank our friends." We haven't had any snow here in Iowa this year and I'm a tad lost. 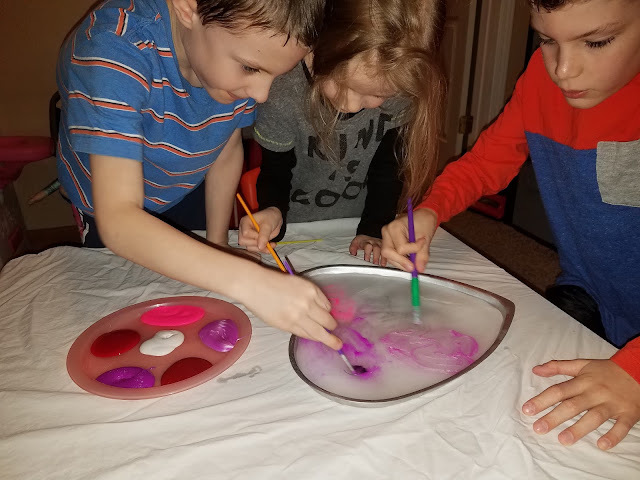 Typically this time of year we're doing our snow activities: making snow ice cream, snow painting, playing in and with the snow, melting experiments, etc. 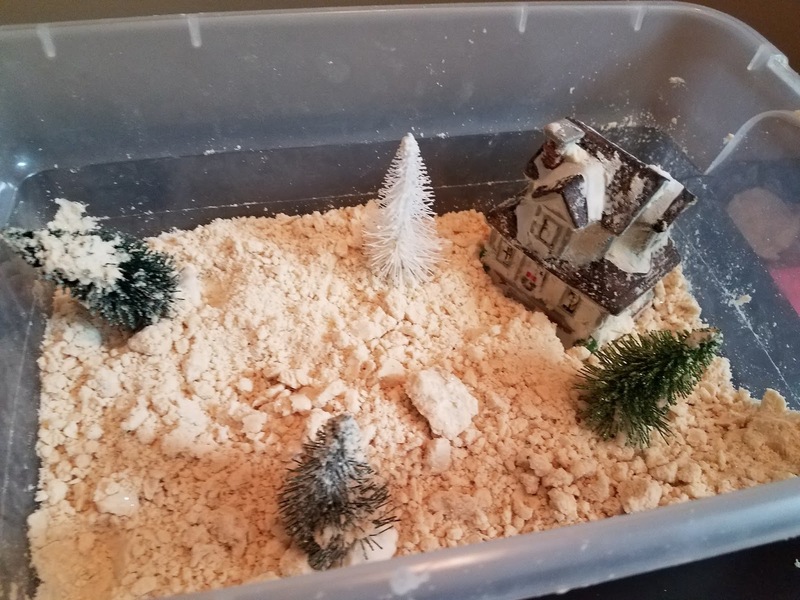 I've had to come up with some new activities to do instead of our winter favorites. The kids painted polar bears. 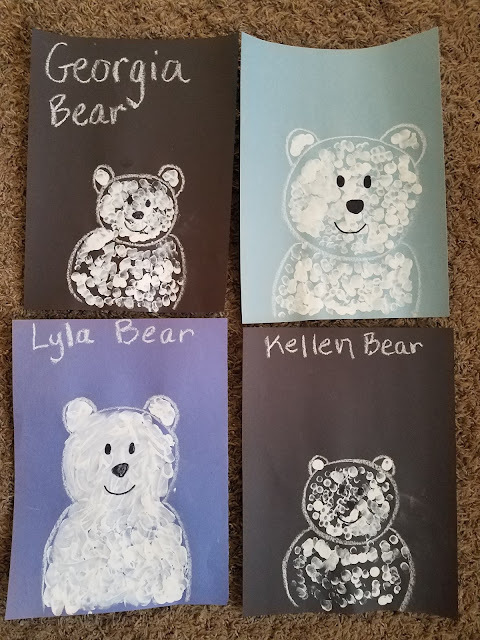 I drew the bear outline and helped them keep their fingerprints inside the white lines (an unheard of concept with toddlers). They turned out really cute! I even had the 15 month olds do one. 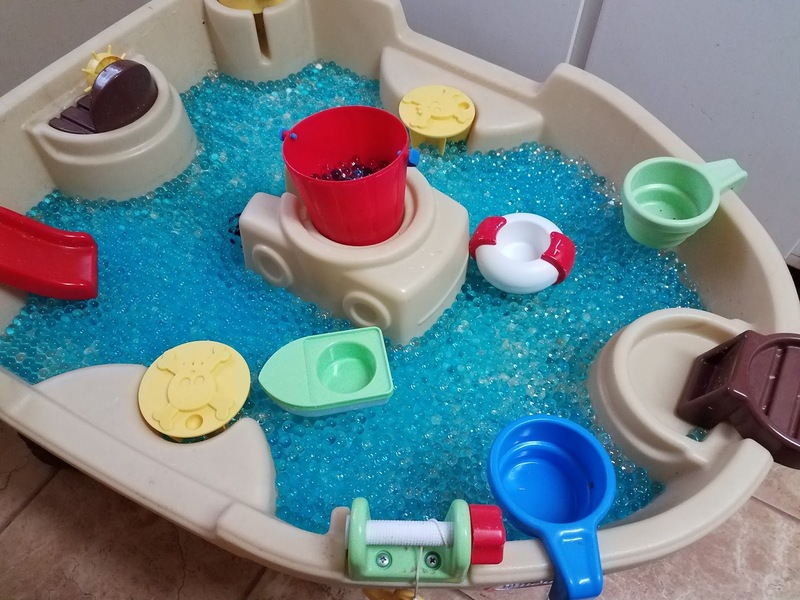 The water table filled with water beads. 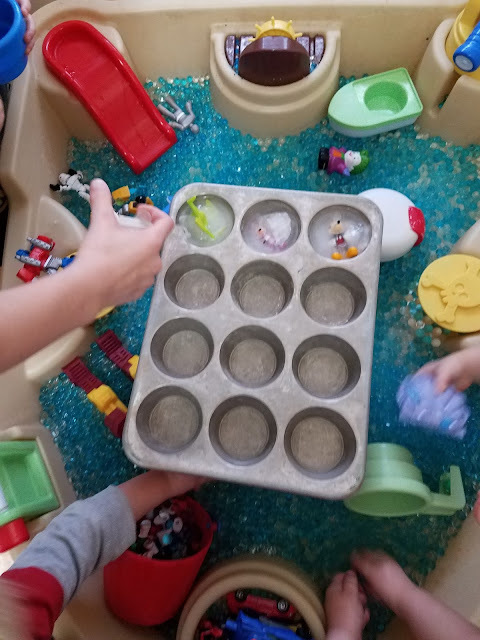 During the second week, we froze some of the water beads and then put them in with the others to play with them as they melted. The kids especially loved that activity, minus their hands being cold! Simple pasta and play tools makes for a fun sensory activity! 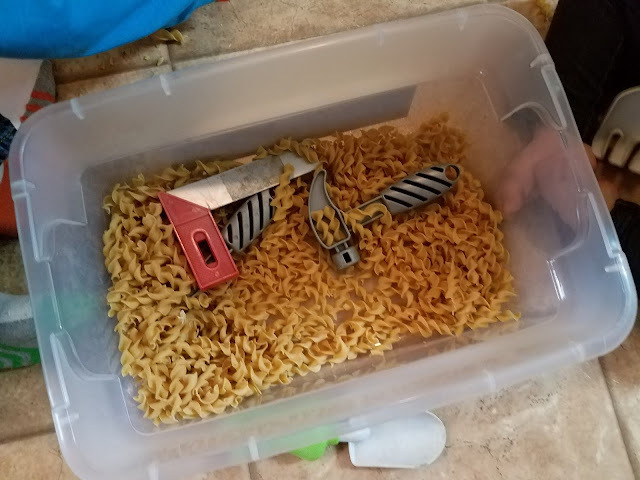 First, I filled the bin halfway with uncooked noodles and buried the tools in the noodles. 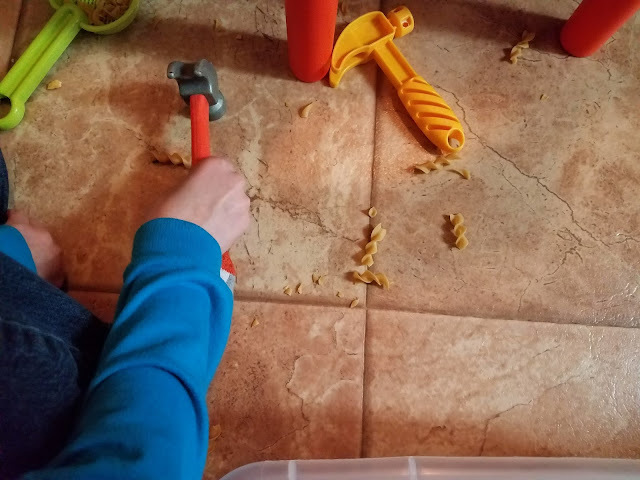 The kids had to find the tools then they got to crack the noodles with the tools. Slightly messy but easy clean up. The kids made monsters (a two day project due to drying paint and glue). 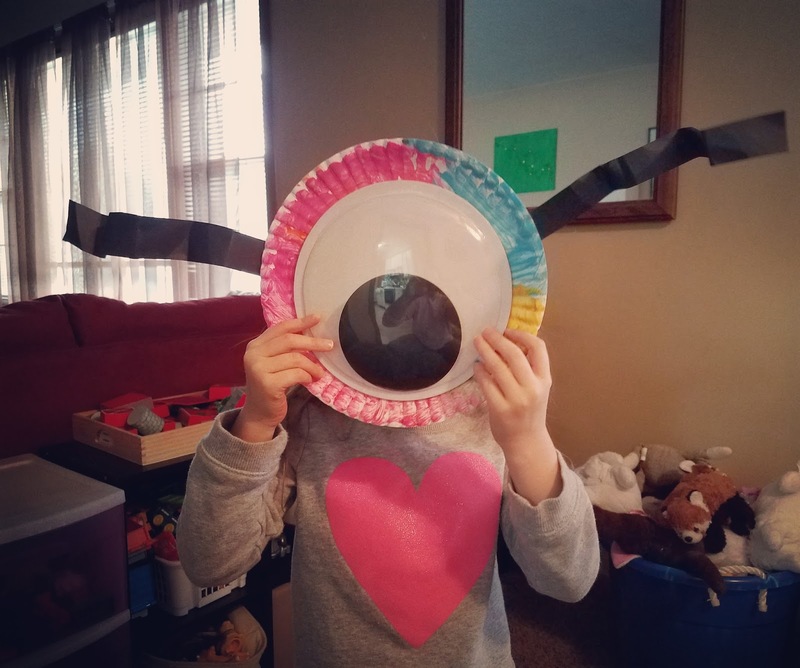 I found the giant monster eyes at Michael's and instantly thought of making these. First the kids painted white paper plates. Once dried, we glued on the monster eyes and taped on "arms." The preschoolers are working on cutting skills. I laughed when I discovered a huge pile of papers cut in half. Luckily I've been able to use them for the kid's daily schedules. 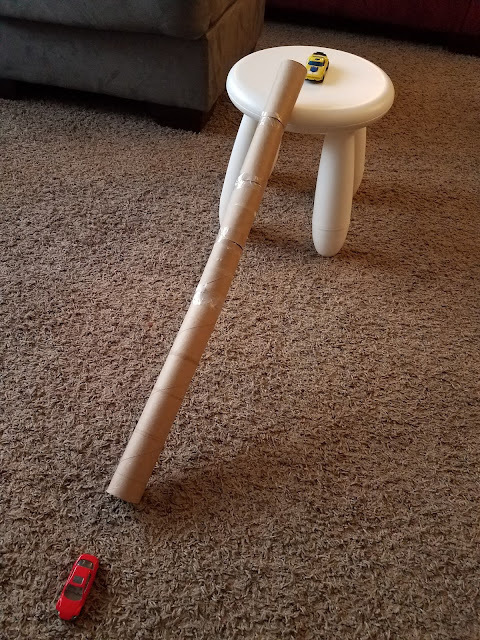 The kids did some car racing with paper towel tubes and Hot Wheels. The two year old crowd LOVED this! Best moment of the week was when a one year old grabbed the stuffed eagle and announced "oh, eagle has poopy diaper. Lot of poop. 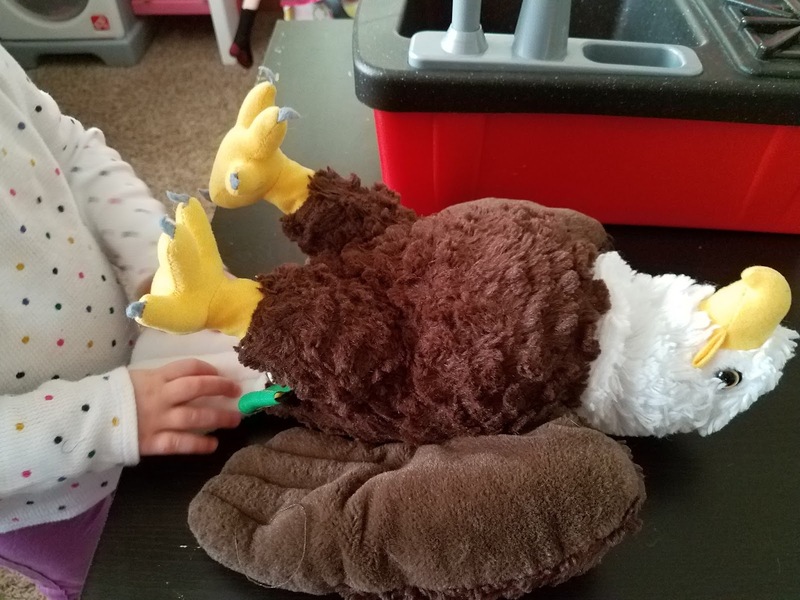 Yucky poopy," and proceeded to "change eagle diaper." All of the kids that were awake (it was the tail end of nap times) fully supported this and crowded around "the eagle with the poopy diaper." 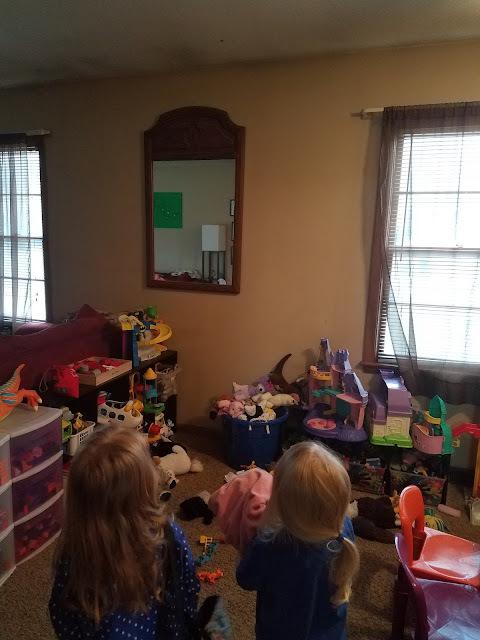 They all clapped when the changing was completed. I died. 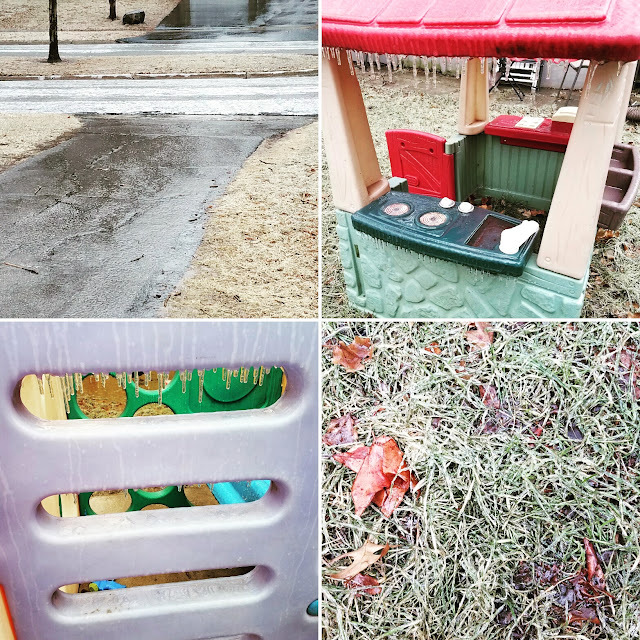 We had an ice storm at the beginning of the second week. I already had that day off, but it gave me the idea for ice themed activities for the week. 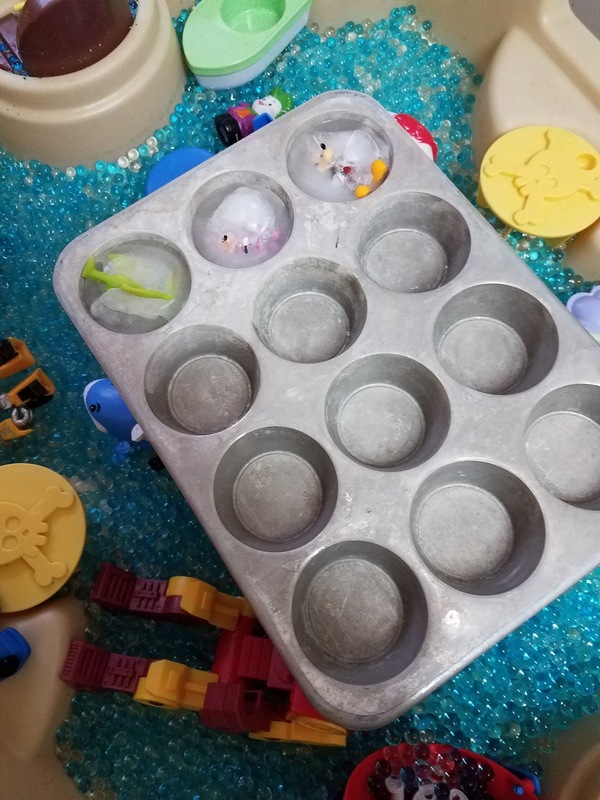 We froze toys in muffin tins and used warm water to melt the ice away. 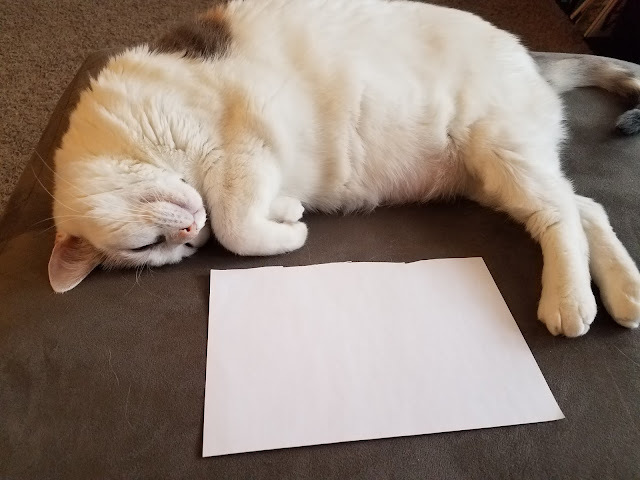 We've done this activity a few times before and it never gets old. The "snow" bin. We used our flour sand recipe (4 cups of flour, 1 cup of vegetable oil) and added glitter. Then we put it in the refrigerator for a half hour so it was cold before playing. 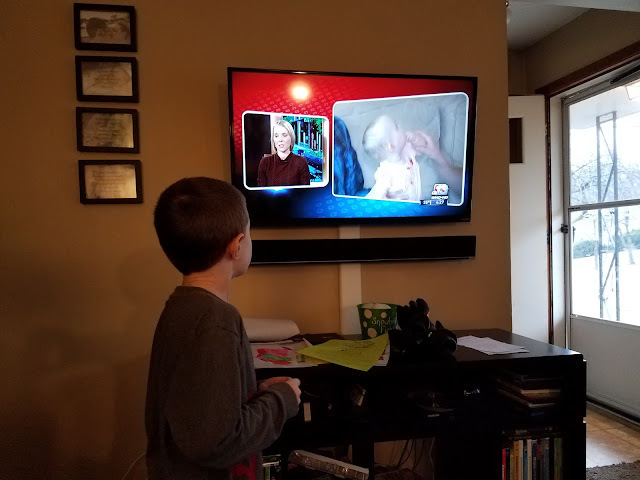 One of the daycare moms was on the news talking about CMV. We watched because their daycare friend (her daughter) was born with CMV. You may remember that the kids chose to donate their lemonade stand money to the National CMV Foundation last summer. For more info on CMV, click here. 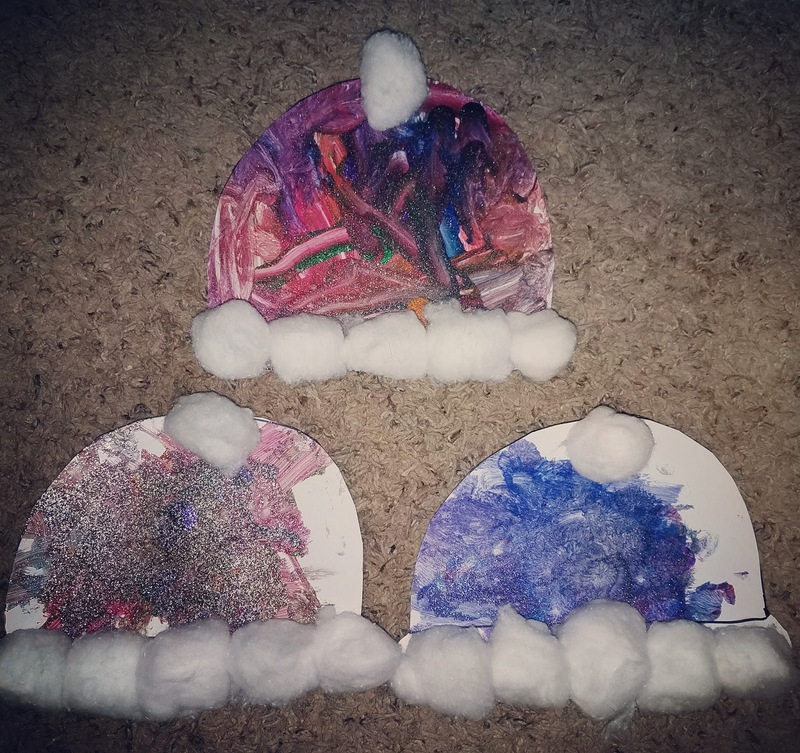 Snow hats painted with glitter paint. Also a two day project due to all of the drying of the paint and glue (to put on the cotton balls). We did a few games with the Sphere. 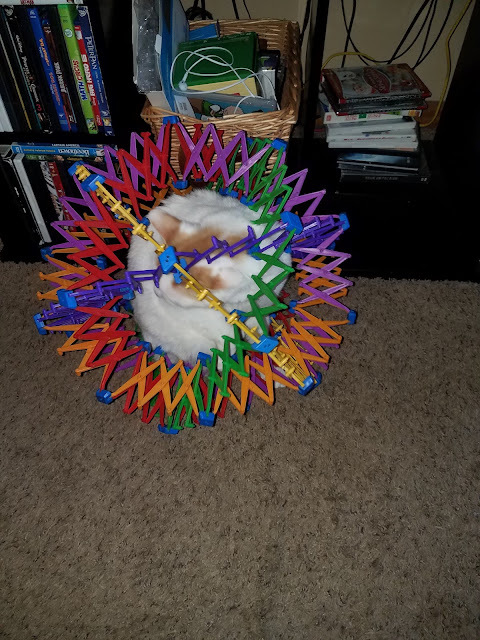 We left it sitting on the floor during lunch time and came back in the room to find the cat stuck in it. Icy play dough was a hit! 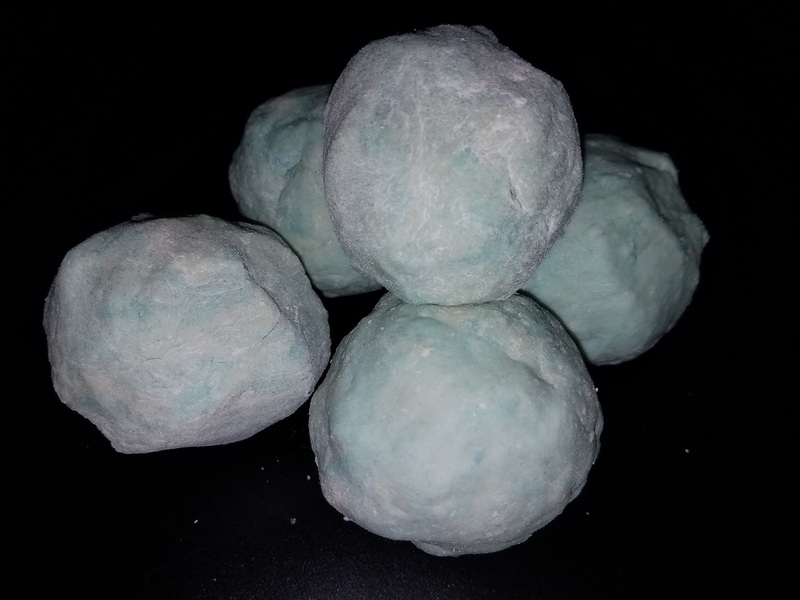 We tried a new play dough recipe (soapy salt dough) and then put it in the refrigerator for 2 hours to make it cold. 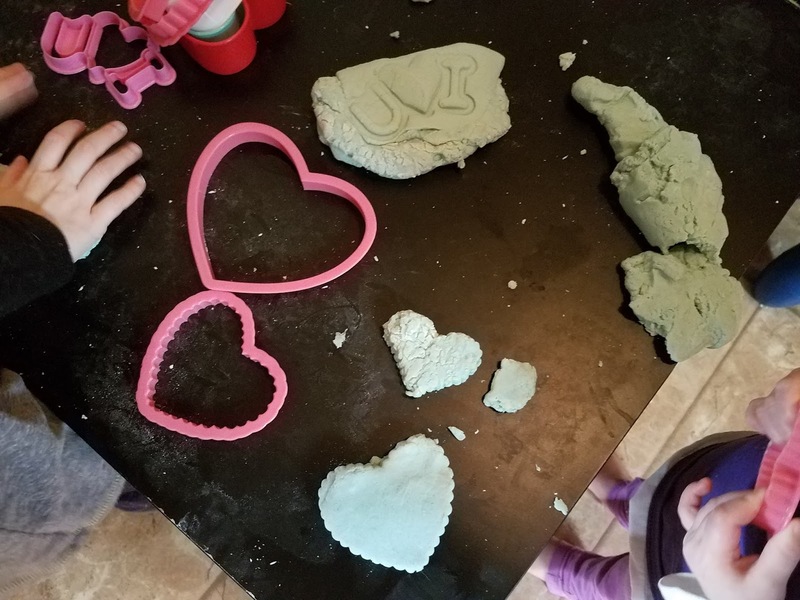 Honestly, this recipe felt no different than our usual salt dough recipe (other than it smelled pretty good because of the dish soap) and made it unsafe if little mouths decided to do a taste test. Although it did work well for this activity since we refrigerated the dough before playing. * Tip if you plan on trying this activity: you'll need to add a few drops of water to the dough before playing. It dries out quite a bit when sitting in the refrigerator. 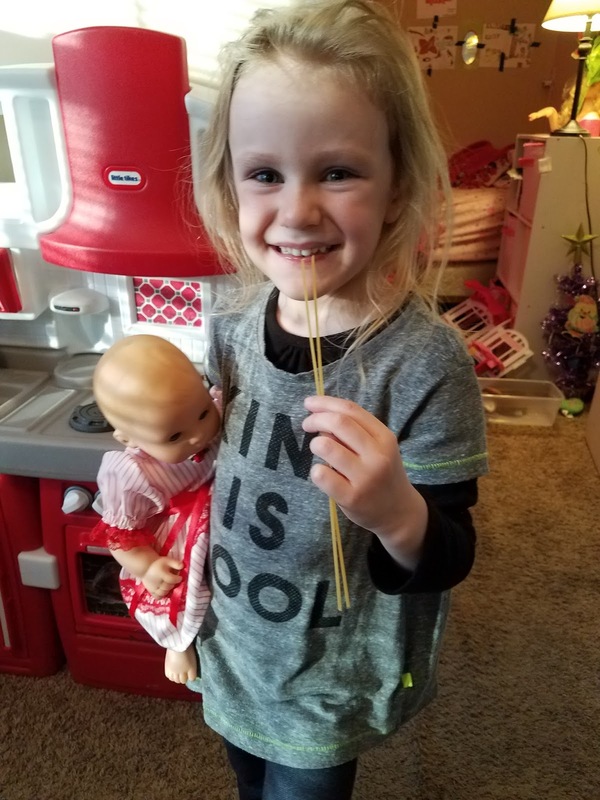 All of the kids love spaghetti night in our house because I start cooking before daycare ends and all of the kids get uncooked spaghetti noodles to bite on. I think it's disgusting but they love them! I had my minis try out Icy Heart painting first to see if it's something to try for daycare. We had success! Daycare will be doing this next week. Read how to do Icy Heart Painting here. Friday turned out nothing like I had planned (that happens often around here though). 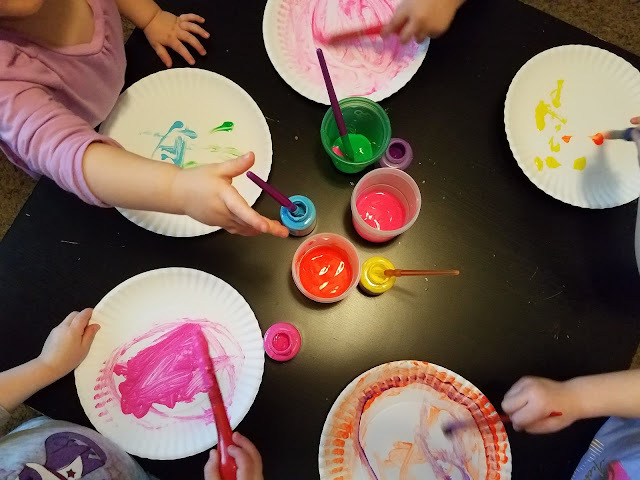 I had some fun activities laid out for the day: paint your own toast for morning snack, baking soda play and experiments, reading our Valentine's Day books, and a game of Find It (toddler and preschooler addition). When I attempted our first activity, I got "leave us alone! We're playing. We don't want to do that!" So they played and they played well together, minus a mishap with the Aquaphor ointment I didn't know the youngest mini had on her. The only thing we got around to that day was reading books.....and they wanted to read "the snow books only." 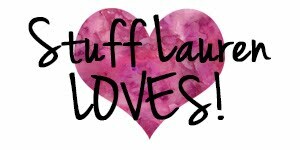 We'll be doing our Valentine's Day activities for the next few weeks and we're hoping for a bit of snow so we can at least do a couple of my favorite snow activities.